Howard Hanna knows that the communities where our team works and plays are top in the nation. Now, Business Insider agrees! Ann Arbor and Birmingham have been named to its list of top places to live in the United States. Ann Arbor is a beautiful city located about 40 minutes west of Detroit in Washtenaw County, Michigan with a Howard Hanna office. The town was named after the original founders of the city, whose wives’ names were both Ann; and so the city’s name became Ann Arbor, or Tree Town. Ann Arbor has a rich history, which is highlighted wonderfully in its layout. Ford Motor Company’s plant turned out B-24 Liberator bombers during World War II, causing the population of Ann Arbor to explode with an influx of military personnel, workers, and their families. In 1960, Ann Arbor hosted major speeches by the Presidential election’s leading candidates, John F. Kennedy, and the city became a key site for both the American civil rights movement and the anti-Vietnam War movement. Home to the prestigious and well-known University of Michigan, Ann Arbor has great amenities and activities for residents and visitors alike. Downtown shopping, canoeing and kayaking down the Huron River, and frequenting the University’s sporting events are just some of the many things residents enjoy. The city is home to several parks, Matthaei Botanical Gardens & Nichols Arboretum, a hands-on museum, a museum of art, tons of delicious restaurants, including Zingerman’s Deli, and an exciting nightlife. Ann Arbor takes care of its residents by providing a great hospital in the downtown area. 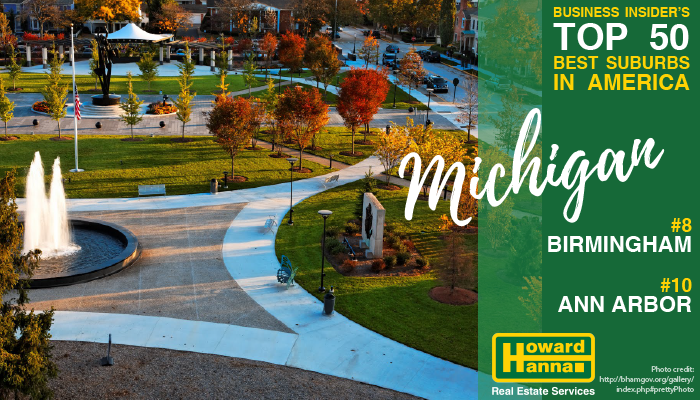 If you’re an outdoor enthusiast looking to purchase real estate in Ann Arbor, it boasts a total of 77 parks, including four downtown. Ann Arbor gives residents countless amenities and conveniences while still maintaining a historic, local feel. Birmingham was established as a manufacturing-based local economy but has transitioned over time into a quaint Michigan village. Situated halfway between the cities of Detroit and Pontiac, Birmingham’s residents enjoy easy access to major freeways. As one of the Midwest’s premiere shopping districts, Birmingham attracts people from across the region. Cultural activities abound, including the Birmingham Historical Museum and Park, Birmingham/Bloomfield Symphony Orchestra and multiple art centers. With golf courses, tennis courts, baseball and soccer fields, playgrounds, bike paths, wooded trails and over 20 parks, Birmingham offers plenty of outdoor amenities. Residents enjoy annual community events, such as a summer concert series, In the Park, the Birmingham Village Fair and the Hometown Parade. The Birmingham real estate market offers a number of different housing options to accommodate all lifestyles, including single-family homes, apartments and larger, more affluent residences. Looking for homes for sale in Ann Arbor or in Birmingham? Our Ann Arbor real estate office and our Birmingham real estate office are both full of real estate professionals happy to help out!